The Fisher Scientific -20 Undercounter Freezer offers your lab a compact foot print that can be placed anywhere you need convenient storage. This lab freezer has a capacity of 5 cubic feet with in the easy to clean ABS plastic. The foamed in place polyurethane insulation helps maintain the temperature range of -12° C to -24° C, that can be set from the mechanical dial inside the freezer. The refrigerant is CFC free. The exterior of the Fisher Scientific -20 Undercounter Freezer is an easy to maintain corrosion resistant enameled steel exterior with two adjustable feet in the front to help level the unit on an uneven surface. 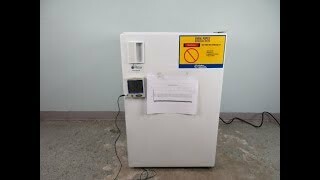 18 x 15 x 27"
This Fisher Scientific General-Purpose Undercounter -20 Freezer has been tested and performed as expected. All of our lab equipment comes with our standard warranty. Should you have any questions, please don't hesitate to contact us.